Both fabulous and essential, this magnificent authentic Cartier tennis bracelet is the perfect piece for both everyday wear and the most elegant of occasions. 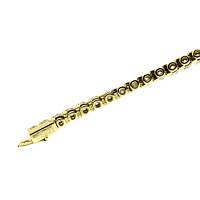 Set in 18k yellow gold with the finest of Cartier round brilliant cut diamonds and weighing a total of approximately 3 carats, this Cartier diamond gold tennis bracelet will immediately be noticed on she who is fortunate enough to wear it. 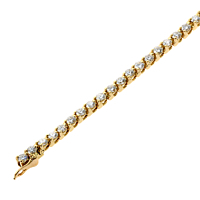 The Cartier diamond gold tennis bracelet is without a doubt a modern classic for any woman's wardrobe!